Originator of Shisakuya, “Sanken Industry” in Katsushika-ku of Tokyo helps prototype production for the future mass production of your products. We provide better service and high-quality service by the establishment of a rigid management structure. This page introduces cooperation across our areas of inspection, sales activities and techniques, as well as activities and establishment of systems to maintain service quality. 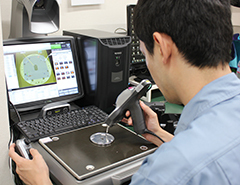 Sanken Industry ensures information sharing and documentation of procedures so that the same inspection as the head office factory is implemented at Atsugi Factory which was built in 2005. With regard to each request of our customers, in our internal network environment, information obtained in meetings with our customers and other data including drawings, CAD data, NC data, etc. necessary for inspection are stored in the database and shared. By adding new information obtained on site and from inspection to the data and updating the data as needed, our inspectors can always use the latest data. By storing order information in the database and establishing work procedures in this way, inspection at any factory produces the same results. In general, undertaken three inspections including the final inspection, products are delivered to customers. Every data is unified on the network ensuring effective sharing and utilization as a tool for sales activities. 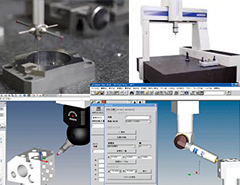 ※3D measuring machine may be used for measurement upon your request. ※We always produce measurement jigs in the case of complex shapes and large number of pieces. 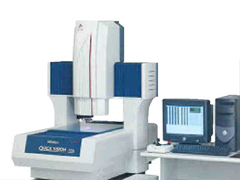 Our CNC inspection measuring instrument is a 3D measuring machine equipped with a highly sensitive CCD camera enabling measurement of parts with 3D structures. Further highly accurate measurement is assured even for a parts of several millimeters in size. The main characteristic of this instrument is non-contact measurement of soft materials such as rubber and elastomer, or the shape of small objects whose measurement is difficult with ordinary 3D measuring machine. 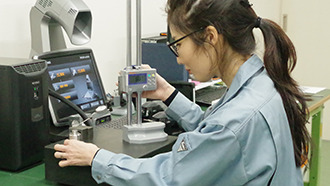 Although this is a simple 3D measuring machine, the work speed is greatly different compared to the frequent use of general-purpose inspection instruments. The use of this machine achieves work by a fewer number of staff. It also serves as an easy-to-use 3D measuring machine. Sanken's Quality Control Department has an important role to guarantee the quality to our the customer. We manage all data obtained after receiving request from customers by our server. We utilize the data for uniform delivery of our service, as well as in inspection and other technical aspects. Highly effectively distributing information and introducing automation to a maximum extent is the base of high mobility in various areas other than technical aspects. We consolidate the management of data on customers’ requests and update (accumulate, delete or manage) the data by each category of sales activities, technique and clerical work on a real-time basis. After the completion of work, with consideration of security and confidentiality, the information is stored by our server managed by Radix. We use the information to deliver service to our customers who are the owner of the information. 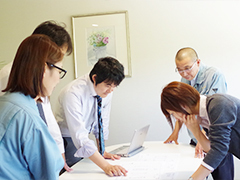 Sanken has an unique organizational arrangement that influence to improve products qualities with having real time direct communication between our sales team and inspection team. For improving communication of intradepartmental barriers, Sanken's sales director is also appointed as a member of the management team of the Quality Control Departments. By this arrangement, it realizes the voice of our customer not to mention sales department to reach Quality Control Department directly. Consequently the change of the manufacturing method can be done speedily and dynamically on the production site. 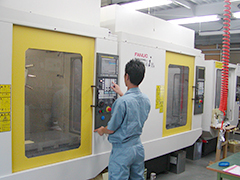 Our engineering department is separately located in the head office factory and Atsugi factory. The factories and business offices are under the close mutual cooperation system, not individually developing operation. Specifically, all staff participate in regular “technical meetings” held every month by using the Polycom’s video conference system as a communication tool. In addition, the head office also held meetings to review NC data. In this way, sharing all information including details difficult to convey by phone and email has successfully reduced unintentional misunderstanding within the company in a dramatic way. Active communication made even in remote locations has led to strengthened trust relationship of the entire staff. 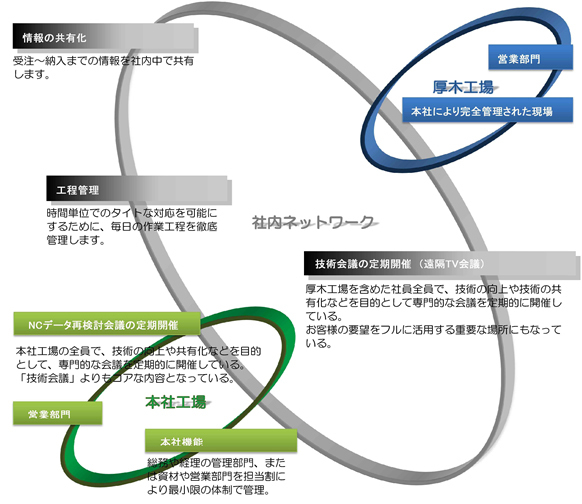 Sanken Industry are strengthening the tie between sales staff and technical staff through the communication system and the information sharing system, and technical staff themselves who produce products are able to timely respond to customers in a technological aspects (limited to customers whose request can be handled). We deliver uniformed service, and at the same time provide higher-quality service to customers.